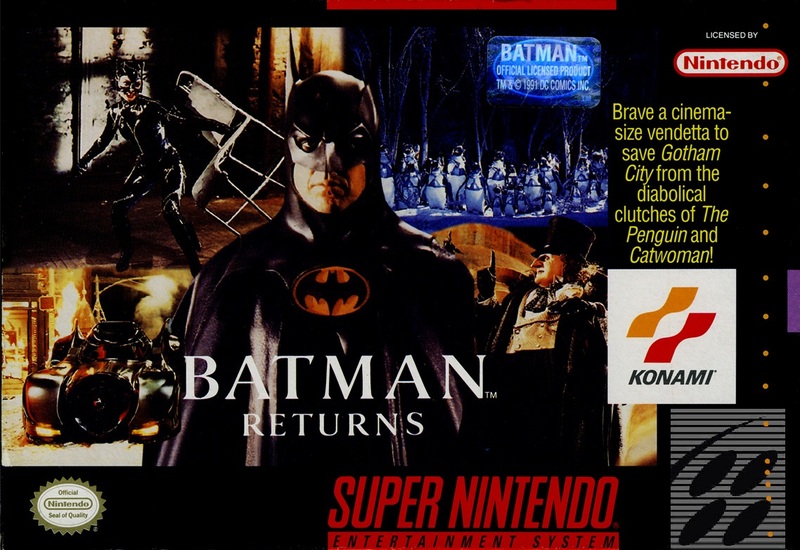 Like Sunsoft before them, Konami produced both an 8 and 16-bit versions of a Batman game of the same name in Batman Returns. Unlike Sunsoft however, who somehow managed to make worse games despite having access to better hardware in both the cases of Batman on Sega Genesis and Batman: Revenge of the Joker, Returns on SNES is a much more recommendable game than its 8-bit counterpart and stands as one of the most fun Batman games even by today’s standards. None of this should come as much as a surprise though, as Konami’s catalog of games in this generation of machines stood right up there with other well-known eastern third-party publishers like Capcom and Squaresoft. Batman Returns on the SNES, exactly like its cousin on the NES, takes all its story from the film, something that I won’t go into any significant detail here as Batman Returns the film is over twenty years old at this point and I touched briefly on it in my review of the NES game of the same name was well. As it’s now on the much superior SNES hardware, this game does a much better job of communicating its story with some great digitized stills from the film that look a bit grainy today but I’m sure were pretty impressive back in 1992. On the upgraded 16-bit hardware the music is also much better than the 8-bit game, which had some great music don’t get me wrong, but this game features easily recognizable renditions of Danny Elfman’s film score that not only compliments the action very well, but also adds a somber tone to the between level cut-scenes. The film did have its fair share of silly moments, like a rubber ducky boat-tank and missile launching kamikaze penguins, but you can’t deny the tragic stories of both the Catwoman and Penguin characters of which the eerie musical score helps in getting across. 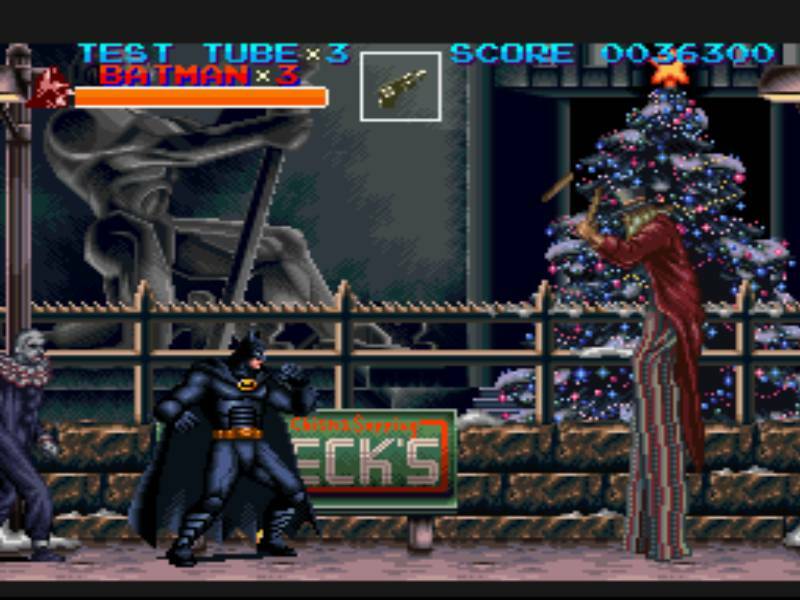 From a gameplay perspective, Batman Returns SNES once again treads similar footsteps as the NES game, and while both are ultimately well worth playing, this game feels much, much better. 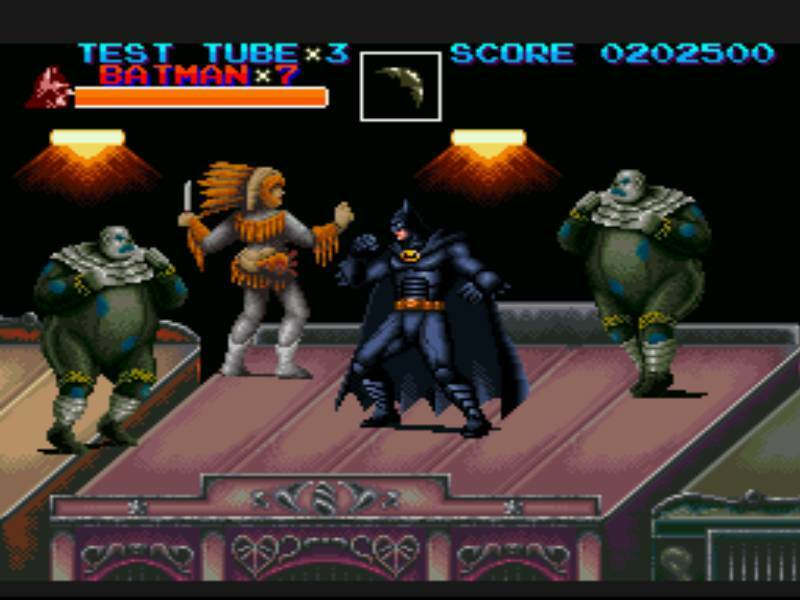 As Batman you crusade through the streets of Gotham City beating on waves of various clown themed thugs from the Penguin’s Red Triangle Circus Gang. Despite playing much like nearly other entry in the beat-em-up genre, including some of Konami’s more famous games that I’ve name dropped on many occasions, Returns stands out from the crowd by how powerful Batman’s attacks feel. Each punch you throw and connect with feels incredibly satisfying, as do the various throw attacks; hurling a bad guy into the ground or violently against a wall, makes you grateful you’re not in the shoes of the opposition. One of my favorite moves that’s a bit difficult to line up has Batman slam two foes that are on either side of him together. Not only does this do a tremendous deal of damage, but it also looks insanely cool as well. About as awesome as it looks, yeah. Batman’s gadgets play a much greater role here than on the NES which only had a pointless grappling hook and the batarang that was only good for use on bosses. Both are still the only real gadgets here, with the addition of a consumable “test tube” that clears the screen of enemies, but the batarang thankfully has unlimited ammunition and is perfect for stunning enemies, leaving them open for attack, or hitting goons that ride on motorcycles. The grappling hook still isn’t nearly as useful as the batarang, but at the very least you can perform a horizontal swinging kick at any time. The best use of the gadgets are in stages where Konami injected some much-needed variety in the game. In a few levels and a couple of bosses the game switches from the regular beat-em-up layout into a more traditional side-scroller. Standard punches are replaced by batarang throws exclusively and the grappling hook is use more traditional to cross pitfalls and fire traps. These parts are few in number, less than a handful, but serve as a palette cleanser that also appears as a test for what Konami would go on to do with their “return” to the license in The Adventures of Batman and Robin. It also makes you rethink how you go about attacking foes as you have to mindful of enemies that are higher up, such as stilt-clowns, and not letting enemies get up close to you. One of the only downgrades from the NES is that you only get to ride one vehicle here as opposed to two, in this case, the Batmobile. 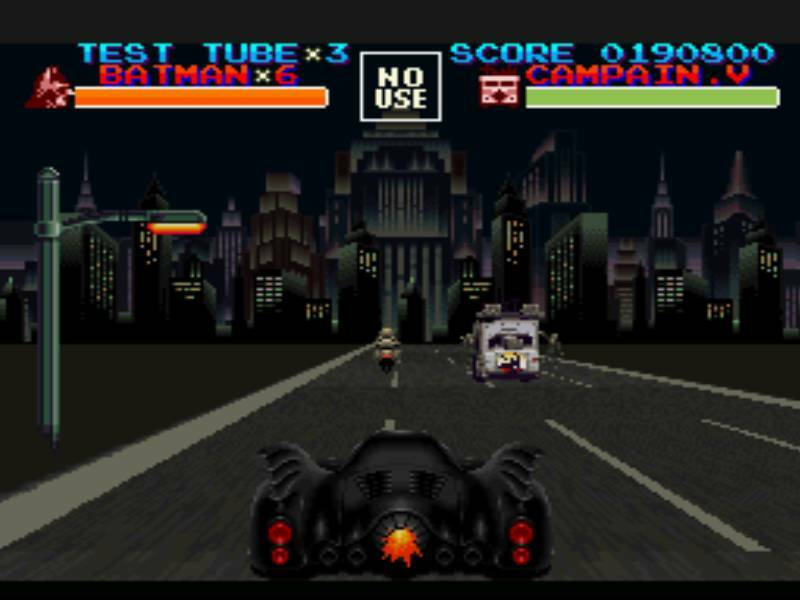 The Batmobile only plays out as one part of a stage and exists more to show off what the SNES hardware can do as the vehicle crests up and down on the road, giving the illusion you’re doing something more than driving on a set track. The perspective is from behind the Batmobile and the player more or less just moves from left to right shooting at targets and avoiding obstacles. Nothing terribly advanced, but like the traditional scrolling stages it’s a nice bonus to an otherwise basic, but still fun, game. Returns on NES was a challenging game that never got too frustrating thanks to unlimited continues and a very fair password system. The SNES game axes both of those helpful tools, making this game much more difficult, but still never unfairly so. You can adjust the difficulty as well as the number of lives to put the odds in your favor and conversely decrease your chances and up the difficulty if you’re seeking a greater challenge. This is not a very long game, for the purposes of this review I picked it up having not played it in a few months and completed it in around an hour, so even if you run out of continues and have to start over, it never takes long to get back to where you left off. As this is a really fun game too, practicing until you get beat the Penguin in the last encounter never feels like a chore. 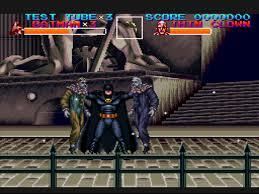 Batman Returns SNES is another shining example of just how much Konami was on fire in the 16-bit era. Excellent feeling fisticuffs that accurately channel the feeling of being Batman to the player, outstanding music taken right from the film combined with a well-paced campaign that breaks itself up with some clever diversions makes this not only a very fun video game, but a rare example of a movie game that lets you play the film of the same name in the best way possible. It can be tough, and a little short like all beat-em-ups, but neither of those two bullet points should prevent you from owning Batman Returns on the SNES.